Our Business Card Magnets and Car Magnets are a great promotional item for your business with plenty of marketing potential. The Simple yet sophisticated design will impress customers, clients and staff. 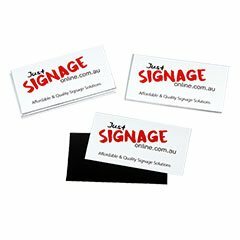 This product is suitable for indoor use as fridge magnets and outdoors on cars, panels etc and are an effective way to keep your contact details visible. We pride ourselves on offering the greatest range of customisation options at the lowest cost. We offer digitally printed graphics using either your own graphics or you can use our in-house designers. Service. Call or email us at any time and we will assist with all your needs including pre-purchase mock ups if required. As an online only business, we have no retail outlets, and pass the cost savings on to our customers. As such, we boast attractive prices across our range, which can be shipped anywhere in Australia. We offer a price per order which starts at $35 for 25 Business Card magnets. Our shipping is a flat $14.95 anywhere in Australia. 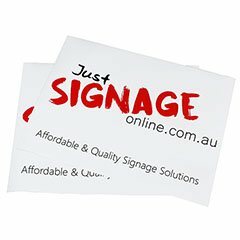 Just Signage Online specialises in all types of signage for all different industries providing affordable quality online signage service.